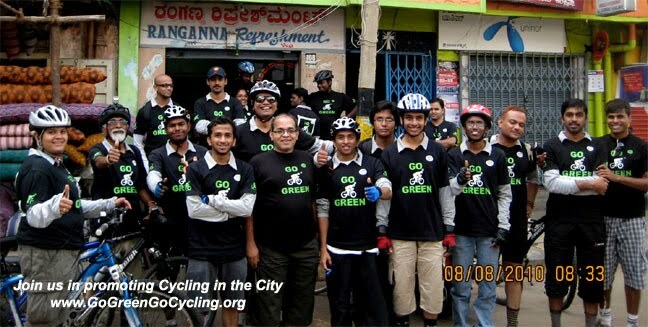 GoGreen Campaign Ride 08 Aug 2010 - GGI-Group size: 4000+ Professionals, Increasing on day to day basis, Come & join us 2 serve Mother Nature. The GGI-South group of about 15 members started off from the starting point, Reliance Apple Showroom at JP Nagar, at about 6.45 am. 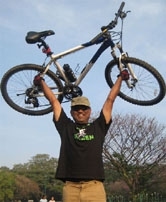 Weather was a bit cloudy and but not raining, a very apt weather for a bike ride. Circle -> JC Road -> Cubbon Park. for today's ride. They happen to be identical twins; the first ever pair of twins in GGI group !! 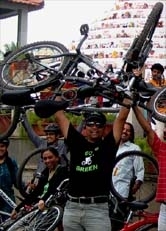 Rao nicknamed as Go Green Twins. Coincidently, one of them had a BTwin Road bike. After the shoot, we decided to go for the breakfast. 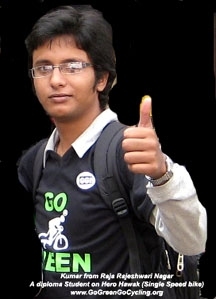 Shantu suggested a nearby place, Ranganna hotel, at Sampangiram Nagar. We had Idli, Rice bath, wada and yummy masala dosas. We finished our breakfast by around 9.15 am after which we headed back. 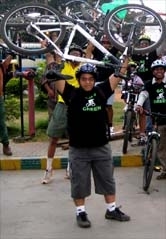 Overall, the overall distance covered was about 24 kms. Group Photograph @ Cubbon Park Chamarahendra Wodeyar Statue. Group Photo infront of Ranganna hotel.